The Australian Energy Market Operator’s report (summarised here by Sophie Vorrath) into the power failure (caused by a lightning strike) that affected Victoria, NSW and Tasmania in August 2018 illustrates the complexity of maintaining reliable electricity supplies across Australia’s east coast … whatever the power sources. However, the reporting of the AEMO’s findings by The Australian was less than comprehensive, misleadingly making it look as though the problem was entirely attributable to the failure of solar energy supplies – well, who’d have thought it?? And just to show that we favour no-one in our commentary on Australian media, on 19 January 2019 the Newcastle Herald (previously part of the Fairfax stable and now owned by Channel 9) published an article titled ‘No drag in wagon demand’ which reported that 96 coal wagons had been delivered to the rail company Aurizon ‘to support Asia’s strong demand for the Hunter Valley’s high quality thermal coal’. Most of the article was a lengthy quotation from an Aurizon executive. More notably however, the whole article was a word-for-word copy of a press release issued by Aurizon three days earlier. What appeared to be a news item actually contained no journalistic input from the Herald and was simply a free advert for Aurizon. King Coal still reigns in some places. Oceans absorb 93% of the heat trapped by greenhouse gases. Without the heat trapped in the oceans the world’s surface temperature would have risen much more than the 1oC average already observed. Improved data collection in the oceans indicates that they are warming 40% faster than previously predicted. This has serious consequences for oceans currents, marine life, weather patterns and extreme weather events, and human food supplies and health. It is also more evidence that the effects of global warming are occurring much faster than predicted a few years ago. While I’m talking about the oceans, Geoff Russell aims some fairly friendly fire at the war on waste, not so much the television program itself as the idea that stopping the use of plastic straws and take-away coffee cups will solve the problem of plastics in the ocean. The appalling number of deaths of seabirds and turtles caused by the fishing industry and plastic nets comes in for particular attention. And as we are encouraged to eat more fish and less red meat for health and environmental reasons this is only likely to get worse unless action is taken to clean up the industry’s practices. That all said, getting the general public involved in campaigns on straws and coffee cups does start to get them personally active on environmental issues – an essential element of pushing politicians to be more active. Finally, my graph for this week (produced by Carbon Brief from Cheng et al, Science Advances, 2017) returns to the issue of the warming of the oceans. The columns show increases in the total heat content of the world’s oceans from 1955 to 2018; the light blue being the increases from the surface to a depth of 700m and the dark blue being at depths of 700-2000m. 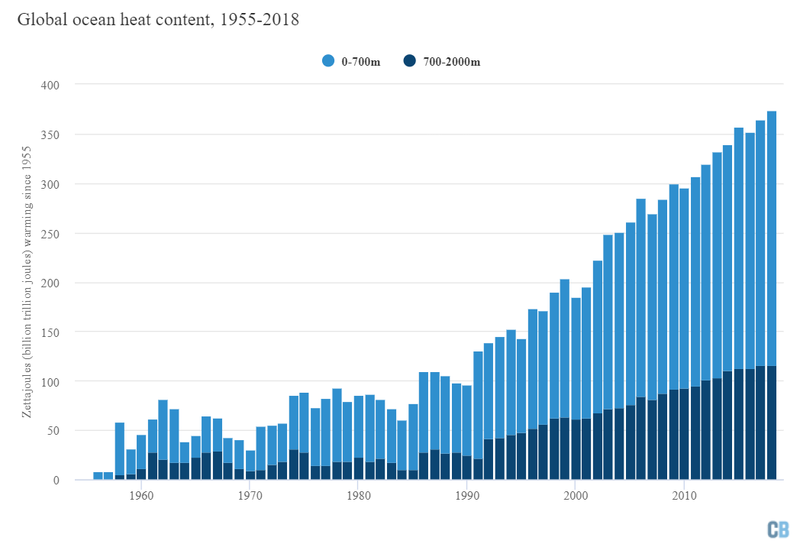 The total heat content has been rising at both depths since 1955 but the increases became more consistent and accelerated around 1990 when the average annual increase roughly tripled. Ocean heat content change is in some ways a better representation of the effects atmosphere carbon dioxide levels and global warming than change in the average global surface temperature.